Emotion and intuition guide this experimental violinist as he creates beautiful textural sound-worlds from his instrument and pedals. In 1968, Bruce Nauman tuned his violin to D-E-A-D. Fifty years later, and somewhat less portentously, Zachary Paul, appearing on stage at last year’s Desert Daze Festival in California, tuned his to G-D-G-D. The results are hardly less minimal and hypnotic but certainly more sensitively played. The Californian composer-improviser’s first solo album under his own name, for Touch, starts by erecting a dense fog of swirling harmonics, building up long loops of heady drones in uncertain, shifting layers. It’s just one man on a stage, a single violin and some electronics, but it conjures up a whole world in short order. 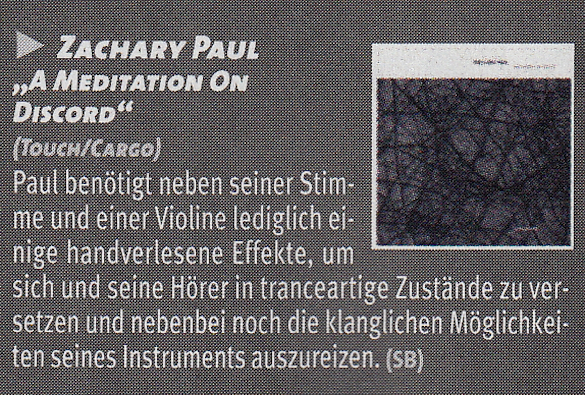 Fans of Tony Conrad’s Early Minimalism project and the Theatre of Eternal Music will recognise Paul’s penchant for long tones and the swell of tightly packed resonant frequencies. This is music to swim in and to feel oneself swum through by. That first track, ‘Premonition’, improvised live at Desert Daze, lasts a cool half hour and probably contains less information , in the strict Claude Shannon sense of the term, than most three minute pop songs. That’s hardly the point, of course. ‘Premonition’ could last three minutes or it could last three days or three weeks. It is not the journey but the landscape. Something in the timbre of the second track ‘Slow Ascent’ feels almost old time-y to these ears. Speed it up a few hundred percent and it could almost be bluegrass. As it is, it would sit comfortably flitting amongst dappled light in one of the dreamier sequences in Andrew Dominik’s (2007) film, The Assassination of Jesse James by the Coward Robert Ford. Final track, ‘A Person with Feelings’ actually is a film soundtrack, though not to anything so mainstream as a Brad Pitt movie. Paul himself describes it as a “modern trance” film and it’s here that the electronics take precedence over the violin, resulting in something a little gloopy for my taste. He’s generally a lot more inclined towards time-based effects like reverb and delay than his east coast forebears from the 50s and 60s, tending to smooth off his own rough edges and mellow his own twists and turns. This may disappoint the minimalist purists, but it certainly makes for a sweeter listening experience. For his debut, Zachary Paul joins a relatively long history of radical dronesters and minimalists that aim not for you to experience music differently but to alter your very perception of reality. The first two tracks are tied to a place and time (“3:30 PM Lake Perris”, for the first, and “9:30 PM Downtown”, for the second) while the third one consists of a soundtrack to a short film about an actor’s inner life: sound is a bridge extending outwards from our skin and into the world. It is, of course, not a bridge made of concrete and steel, but one that has an emotional foundation, the kind of bricks and stones that lead more than a few to see sound and hear color, a mutability that shifts with every passing second. 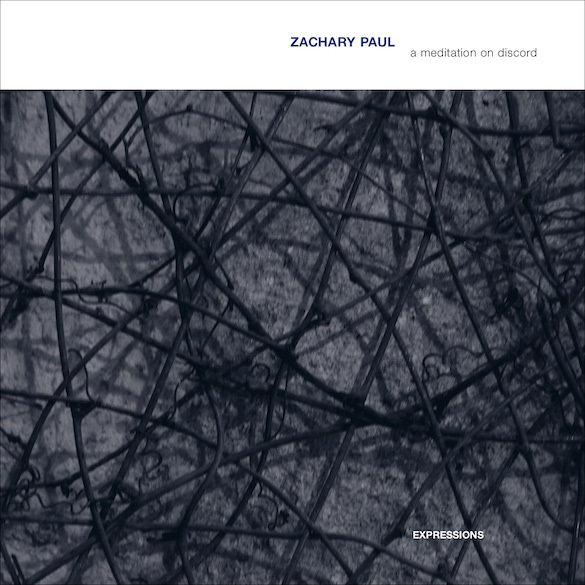 Contemporary violinist Zachary Paul appeared on Simon Scott’s recent album for Touch, and now releases his solo album (after a number on other labels as Poppy Nogood (Terry Riley tribute!)). There are two works for violin & electronics performed live, but this is a soundtrack to an experimental film. I love how the violin slowly emerges from the synthesized sounds – it’s impressive stuff.